The ACC-004 precision interchangeable NTC thermistor from Ametherm is part of their ACCU-CURVE™ series. The ACC-004 offer a high degree of accuracy and reliability with a resistance of 10kΩ at +25°C and a temperature tolerance of ±0.2°C between 0°C and +70°C. The Ametherm ACCU-CURVE™ series commonly perform temperature sensing, control and compensation for medical, industrial and automotive applications. The complete series offers interchangeability over a broad temperature range and eliminates the need to individually calibrate or provide circuit compensation for part variability. Resistance / temperature curve "C"
Additional Features Precision interchangeable NTC thermistor. Small bead design with 32AWG tinned copper leads. Resistance / temperature curve "C". Beta value of 3892°K (0°C / 50°C). In this overview of NTC thermistors, Ametherm look at the different kinds and application uses for temperature sensing and how NTC thermistors accurately measure and compensate for temperature. 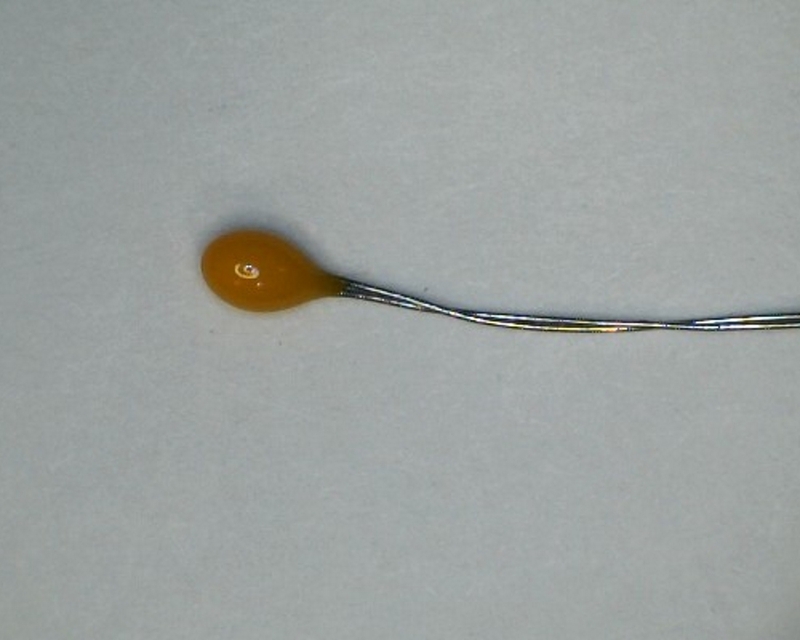 This video will start by looking at the different types of NTC thermistors, such as probe assembly thermistors, disc and chip thermistors, and customizable thermistors. The different thermistor attributes will be examined, including voltage/current and resistance versus temperature. A short video to help with selecting the right NTC thermistor. ACCU-CURVE™ precision thermistors offer interchangeability over a broad temperature range and eliminate the need to individually calibrate or provide circuit compensation for part variability. These NTC thermistors are used in many applications that require a high degree of accuracy and reliability. They commonly perform temperature sensing, control, and compensation for medical, industrial, and automotive applications. Interchangeable ACCU-CURVE NTC thermistors are usually selected when a high degree of measurement accuracy is required over a wide temperature range. The ACC-001 precision interchangeable NTC thermistor from Ametherm is part of their ACCU-CURVE™ series. The ACC-001 offer a high degree of accuracy and reliability with a resistance of 2.252kΩ at +25°C and a temperature tolerance of ±0.2°C between 0°C and +70°C. The Ametherm ACCU-CURVE™ series commonly perform temperature sensing, control and compensation for medical, industrial and automotive applications. The complete series offers interchang.. The ACW-007 precision interchangeable NTC thermistor from Ametherm is part of their ACCU-CURVE™ series. The ACW-007 offer a high degree of accuracy and reliability with a resistance of 100kΩ at +25°C and a temperature tolerance of ±0.2°C between 0°C and +70°C. The Ametherm ACCU-CURVE™ series commonly perform temperature sensing, control and compensation for medical, industrial and automotive applications. The complete series offers interchangea.. The ACC-002 precision interchangeable NTC thermistor from Ametherm is part of their ACCU-CURVE™ series. The ACC-002 offer a high degree of accuracy and reliability with a resistance of 3kΩ at +25°C and a temperature tolerance of ±0.2°C between 0°C and +70°C. The Ametherm ACCU-CURVE™ series commonly perform temperature sensing, control and compensation for medical, industrial and automotive applications. The complete series offers interchangeabi.. The ACW-006 precision interchangeable NTC thermistor from Ametherm is part of their ACCU-CURVE™ series. The ACW-006 offer a high degree of accuracy and reliability with a resistance of 50kΩ at +25°C and a temperature tolerance of ±0.2°C between 0°C and +70°C. The Ametherm ACCU-CURVE™ series commonly perform temperature sensing, control and compensation for medical, industrial and automotive applications. The complete series offers interchangeab.. The ACC-003 precision interchangeable NTC thermistor from Ametherm is part of their ACCU-CURVE™ series. The ACC-003 offer a high degree of accuracy and reliability with a resistance of 5kΩ at +25°C and a temperature tolerance of ±0.2°C between 0°C and +70°C. The Ametherm ACCU-CURVE™ series commonly perform temperature sensing, control and compensation for medical, industrial and automotive applications. The complete series offers interchangeabi.. 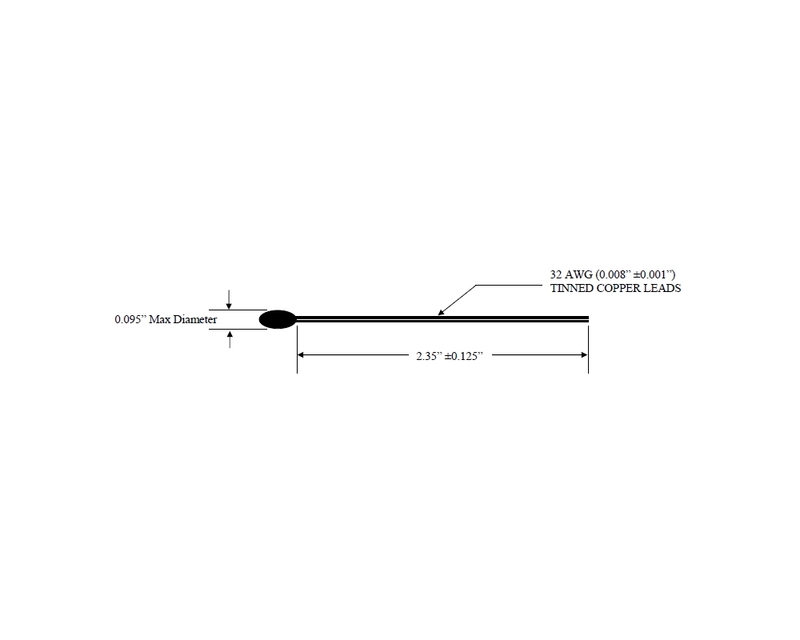 The ACW-005 precision interchangeable NTC thermistor from Ametherm is part of their ACCU-CURVE™ series. The ACW-005 offer a high degree of accuracy and reliability with a resistance of 30kΩ at +25°C and a temperature tolerance of ±0.2°C between 0°C and +70°C. The Ametherm ACCU-CURVE™ series commonly perform temperature sensing, control and compensation for medical, industrial and automotive applications. The complete series offers interchangeab..